Well … because you actually TOOK ACTION and decided to renovate those old and sometimes ugly kitchen cabinets and install brand new ones that will make your life happier. Kitchen for me, as an ex-Chef, it’s the part of the house that I most enjoy spending time when I’m at home. And I loooooove to have a beautiful, organized and functional kitchen to cook my favorite dishes for my kids and wife. 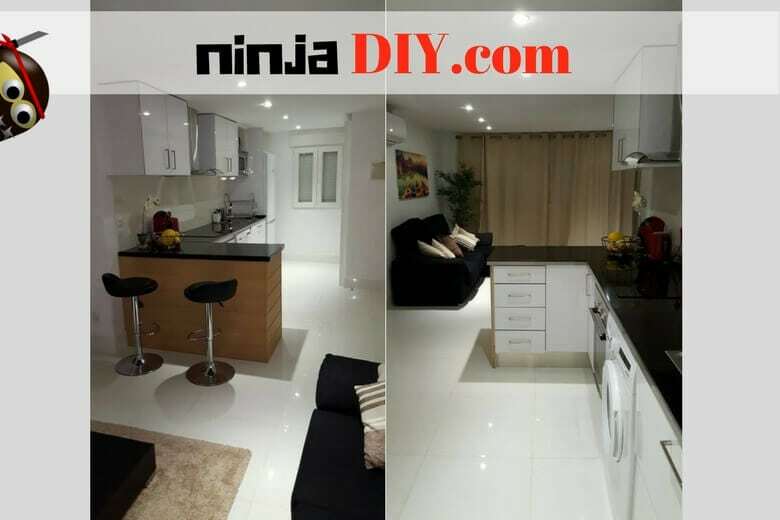 And today, I wanted to bring you ninjas this little guide on how to use a laser level to install kitchen cabinets, to assist you in case you have decided to install kitchen cabinets yourself. It’s not a hard job to install a new kitchen … as long as you have the right tools and a bit of guidance! By the way, check out my laser level buying guide if you need some assistance with choosing a laser level. It would be great to have a new floor in the kitchen as well … and laminate flooring usually it’s an easy option, it looks great, easy to maintain and especially …. easy to install … check it out when you have time! I personally, love these gadgets, it’s such a handy tool to have not only as a Construction Professional but as a homeowner as well. Really useful for DIY projects! Let’s get into the steps of how to use the laser level for installing our brand new cabinets. What we need to make sure first it’s that we know where the high point of our floor is. In case you didn’t know, our floor it’s not always leveled. For that, we set up our line/cross-line laser level on a tripod or screw it on the wall. We set it up at any height, put it at 1,5 m from the floor if you want. This is only going to be used as a guideline, to make sure that we do our marking accurate and plumbed. All pros will start to install the kitchen base cabinets FROM THE HIGH POINT – NOT FROM THE LOW POINT! If you start from the HIGH point though, even if the floor it’s not leveled … the top of your cabinets will be leveled, And you will only have to play with the kitchen cabinets legs in order to adjust the desired height. So, in order to find that high point, you’ll switch on your laser level, take out your measuring tape and start going around, measuring the points at the back of the wall and as well we come out to where the front of the base cabinet will be! Once you’ve found your floor high point, mark it and we go to the next step. Leave the laser on, it will serve as a guideline! If not, if the wall is tilting in some way, then you’ll have to mark where that wall it’s not straight and remember that. Because that will be your reference as the highest point for that wall. Again, we’ll take the straight edge and check for any humps or irregularities in that wall. Mark all the point where your wall is not straight. Don’t skip this part just because you are anxious to see your neaf beautiful kitchen installed. If you mess up this part … you’ll be a very unhappy DIYer … trust me. On the next step, we will still be talking about layout … this time on the ceiling. Yep, we need to do that as well. So if you are going to install kitchen wall cabinets all the way up to the ceiling, you’ll have to make sure that you take reference point from the ceiling as well. Remember that laser level that we’ve set up and left it on? It’s time to use it again. You take your measuring tape and start looking for the high spot as well. Again … measure at the back of the wall and come out to where the front of your top cabinets will be. On this final step of our short tutorial on how to use a laser level to install cabinets, we will make our markings of where we want the cabinets to be installed. We’ll start by measuring the back of our wall top cabinet units. Once we know the size in height of the upper cabinet … we will transfer that to the wall. REMEMBER we measure this from the HIGHEST point on the ceiling. Just mark the point on the wall with a pencil. So let’s say your cabinet it’s 40 inches in height (1 m) … we measure 40′ from the highest point on the ceiling (that we marked previously) and then we make our new mark. This is where the bottom of our upper cabinet will be. But, to make sure it’s at the same level … we take our tape again and measure the distance from the laser level line to the last mark that we’ve made. So, let’s say we have 15 inches (38 cm) gap from the laser line to the upper cabinet mark. 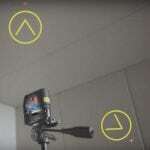 We measure 15 inches from the laser line and we make a mark in each corner of the wall. Then we draw a line on that wall and there is where our upper kitchen cabinets will be installed nice and leveled! Pheww 🙂 We’ve made it. As an extra way to use the laser level for cabinets leveling, watch this little video. These guys are using a very cool system called EZ-level cabinet levelers that helps to do the job quicker apparently. (saying apparently because I haven’t used it yet personally, so I don’t know how good it is, but it looks very helpful in this video). Yes. It’s a time-consuming task. Trust me. I feel your pain. But if you really want to install kitchen cabinets yourself … and make it like a PRO, you’ll have to follow these steps. After all, a kitchen it’s very expensive stuff and you don’t want to mess up with this project. Always keep in mind the vertical and horizontal plan in combination with the high point so everything fits together nicely once you put your new cabinets together. 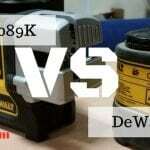 Use some of the best laser levels for installing cabinets, don’t use rubbish, poor quality tools. Aim for good tools and accessories. As well, let me know how your project went. From experience, I’ll tell you that it won’t be a smooth process. But that’s why we are here. We are trying to help with our expertise by giving advice and tips FOR FREE 🙂 so get in touch if you have any doubts and we’ll do our best to assist you.